Leak testing is ideally performed onshore, although construction activities (i.e. delay in construction, offshore hookup spools, etc.) have a tendency to push testing offshore. Offshore leak testing can have a substantial impact on project schedule and planning. The equipment needed for testing requires valuable deck space, additional personnel to perform testing and the suspension of nearby work during testing due to the pressurization of equipment. For higher pressure systems, more limitations are introduced. Restrictions on simultaneous operations are widened, inducing a delay in the project schedule. Therefore, it is important to maximize leak testing activities onshore as much as practically possible. ASME Boiler and Pressure Vessel Code, Section V-A10 “Leak Testing” assists leak testing activities. However, this code should be used strictly as a guideline as it specifically deals with vessels, rather than complete systems. An initial gross-air leak test should be performed prior to any other testing. This is generally performed at 25% of the maximum working pressure of the system or 100 psi (whichever is less). The gross-air leak test allows personnel to locate and repair gross leaks within the system before introducing other testing media at higher pressures, reducing wasted testing media. 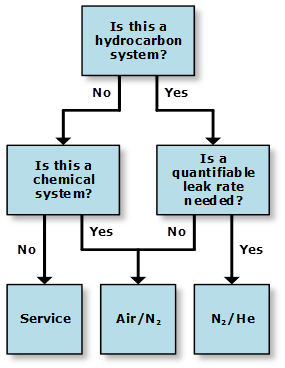 Service leak tests are acceptable for testing non-hydrocarbon, non-chemical systems. Service testing utilizes the service media within facility conditions (i.e. potable water, firewater, open drains, instrument/utility air, etc.). This is the preferred testing media, as it tests systems at normal operating conditions. If service testing is not applicable, non-hydrocarbon systems may be leak tested with air. Using air as the testing media is more cost effective than using nitrogen (N2) or helium (He). It should be noted that the bulk of air molecules (N2 and oxygen) are larger than He molecules; therefore, air is less likely to pass through minute leaks that may be present in high pressure systems. The availability and inert properties of N2 have made it the industry standard when testing hydrocarbon systems. The N2 retained in the systems following leak testing ensures that oxygen content is reduced, avoiding an explosive mixture when hydrocarbons are introduced. A 99% N2 to 1% He mixture provides the ability to measure quantifiable leak rates. In addition, the small size of the He molecule helps identify leaks that N2 alone may not easily reveal. The main disadvantage of using N2/He mixture is cost. N2/He testing requires more equipment than using N2 alone and more time to manage the volumes and proper mixing of N2 and He . A soapy solution is typically used for both air and N2 leak detection. Once the system is pressurized to the test pressure, the flanges being tested are coated with the solution. If the solution begins to bubble, a leak is present at the flange and a repair is required. If a leak is located, the system must be depressurized before any repair on the system may commence. An alternative method of leak detection for N2 testing utilizes an oxygen detector. Once the system is pressurized to the test pressure, the flanges are wrapped with plastic wrap. The tester then punctures the wrap, inserts the oxygen detector probe and measures the oxygen content within the flange. Generally, less than 20% oxygen content confirms the flange is leaking. When using N2/He mixture media, a mass spectrometer (calibrated for He) is used to measure the quantifiable leak rate. Similar to using an oxygen detector, the system is pressurized to the test pressure and flanges are wrapped in plastic wrap. The tester then punctures the wrap with the He mass spectrometer and records the leak rate by measuring the He detected. Acceptable leak rates are generally less than or equal to 150 scf/yr per flange in open areas, while enclosed areas are less than or equal to 20 scf/yr per flange with an average system leak rate of less than or equal to 5 scf/yr over the entire system. Within each test package, it is beneficial to utilize the system pressure safety valves (PSVs) when available. Temporary PSVs must be used if no PSVs are available within testing limits, or if the Operator does not want them used during testing. It is important to size temporary PSVs according to each systems normal operating pressure, meaning multiple PSVs may be required. If incorrectly sized PSVs are used, proper system pressurization cannot be guaranteed. General industry practice shows that systems should be leak tested to 85-95% of the PSV (permanent or temporary) set point. This provides an adequate test pressure, while minimizing the possibility of over-pressurizing and having to recertify the PSVs. There are two primary isolation methods used during leak testing, process and mechanical. Process isolation utilizes valves within the system, while mechanical isolation utilizes torqued blind flanges, spectacle blinds or skillets. If using process isolation, closure of a single ball valve is acceptable for systems with a pressure class rating equal or below ASME 300#, for higher pressure classes, double block and bleed isolation (or equivalent) is required. Double block and bleed isolation may consist of two ball valves with a bleed valve, a single bodied valve with twin balls and a bleed, or a single ball valve with twin seals. It is recommended that secondary isolation be used on systems with pressure class ratings greater than ASME 300#. If the secondary system, which may or may not see pressure depending on the primary isolation, has a lower pressure rating than the primary, a vent path is needed to provide over-pressure protection in case of primary isolation failure. High level procedure describing the system(s) to be pressurized; test pressure; secondary system(s) adjacent to the pressurized system(s); test medium utilized and how it shall be delivered into the system(s); flange management section to provide tracking of bolt torqueing and witness joints. “Test System” P&IDs marked up to highlight lines/equipment to be pressurized; witness joints; test pressure; primary and secondary isolations; testing media injection point(s); vent point(s) for depressurization; PSV(s) and/or temporary PSV(s) (if required); connection points for additional pressure gauges; check valves and dead legs downstream of them. “Secondary System” P&IDs marked up to highlight lines and equipment that could be pressurized as a result of leakage from the “Test System” and vent point(s) shown locked open in the event of “Test System” leakage. By following these guidelines, it is expected that leak testing will be undertaken safely and effectively, whether it is completed onshore or offshore.